orn in Lagos, Nigeria in 1940, of mixed Nigerian and Ghanaian parentage, Tony Allen taught himself to play by listening to records made by the American jazz drummers Art Blakey and Max Roach. He began working as a professional musician in 1960, gigging around Lagos and variously playing highlife and jazz. 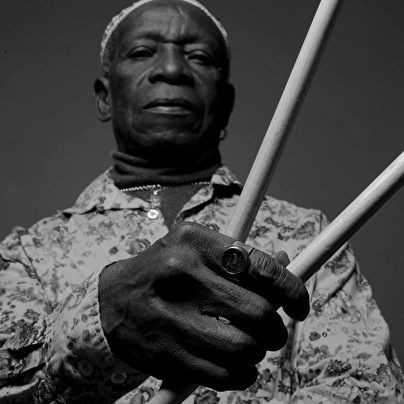 Today living in Paris, Allen has long been acknowledged as Africa's finest kit drummer and one of it's most influential musicians, the man who with Fela Anikulapo Kuti created Afrobeat - the hard driving, James Brown funk-infused, and politically engaged style which became such a dominant force in African music and whose influence continues to spread today. becoming a professional musician. 'My parents were…not keen. Back then, in Lagos, musicians were more or less thought of as beggars, or worse. But I just put it in front of them. I was an electrical technician, but I wanted to make a change. My mother was never happy about it, but my father, who was an amateur musician, eventually agreed." Allen started out as a jazz drummer. 'Art Blakey was my big influence, and before that, before I started club crawling, it was Gene Krupa. When I started, I tried to play like Gene Krupa. Then I discovered Blue Note Records and Art Blakey's Jazz Messengers - it opened up another style to me. Max Roach was important too. I studied some lessons he wrote in Down Beat magazine about how to play high-hats. Most drummers in Lagos never used them, they were just a decoration on the kit,and I'd always thought that was something incomplete."